Supersonic Skydiver's Capsule Going on View in D.C.
Supersonic skydiver Felix Baumgartner is bringing his pressurized balloon capsule from his record-setting jump to the Smithsonian's National Air and Space Museum. The museum is opening an exhibit Wednesday that includes the Red Bull Stratos capsule that took Baumgartner to the edge of space, and one of his pressure suits. The Austrian parachutist known as ``Fearless Felix'' reached a speed of more than 843 mph during his October 2012 jump over New Mexico. That's 1.25 times the speed of sound. 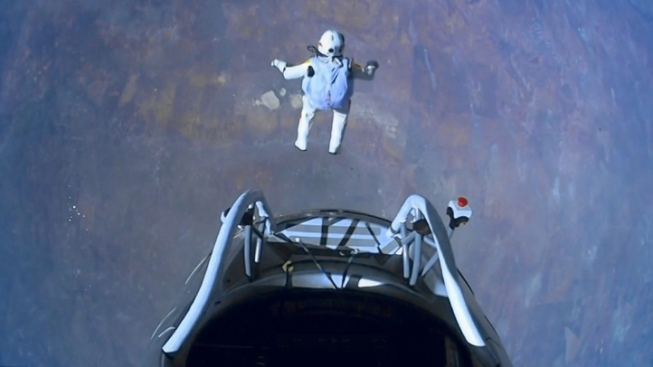 Baumgartner became the first human to break the sound barrier with only his body. A giant helium balloon took him to an altitude of 127,852 feet for the jump. Baumgartner's capsule and flight suit will eventually become part of the museum's permanent collection at its Udvar-Hazy Center in northern Virginia.